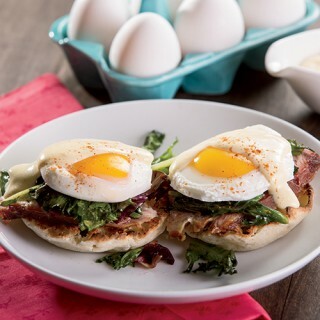 Classic Eggs Benedict is taken to the next level with wilted spring greens. Poach the eggs, taking care to keep yolks intact. Set aside. Melt with butter and saute garlic until just fragrant. Stir the greens into butter and garlic until just wilted. Place a piece of ham on each toasted muffin half. Distribute the greens over each. Work quickly to keep the food warm. Top with an egg and hollandaise sauce.